Favorite Driver: My Father Jack Sodeman Sr. When and how did you get started in racing? Who had the biggest impact on your racing career and why? My Dad and Mom without all the sacrifices they made to help me get started i would never have been who i am or where i'm at. What would you be doing if you weren't racing? What is your favorite aspect of racing? The racing family you will never find a closer, crazier, good group of people anywhere . What is your greatest accomplishment/best memory? The first win is one you never forget but there are many greats for me. The first time I won and had my baby girl in victory lane pictures the stories you pick up from races you have gone to over the years. I think i could write a book. What is the worst thing that has happened to you in racing, or your worst season? To anyone that knows me it will be no shock for me to say July 4 2011 a bad crash I was hurt in and had a long road to get back and you feel bad that you put your family thru all of that. What are your plans for the 2013 season? 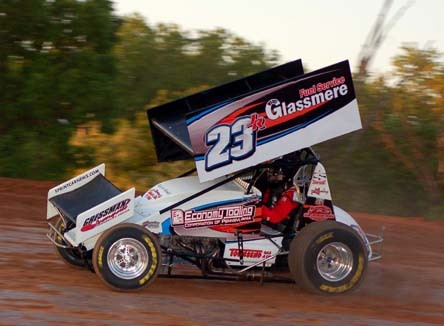 Where do you see Sprint Car racing five years from now? For the first time I don't know. it has got to be so hard just to keep going that you see many teams have left. if you look at my racing what used to be 3 separate teams and cars on the track is now one just to try to keep up. I only hope it keeps going strong. .
To race be competitive and have fun for years to come . Just to thank everyone that has helped me over the years from my family the racing family friends just a huge list i could never pay back or thank enough... and see you at the races!! !